Check our iPath user interface video tutorial. Main parts of iPath's user interface are shown in the image on the right. Main map display displays the currently selected map. Use the icons in the top right to zoom, or use your mouse wheel. 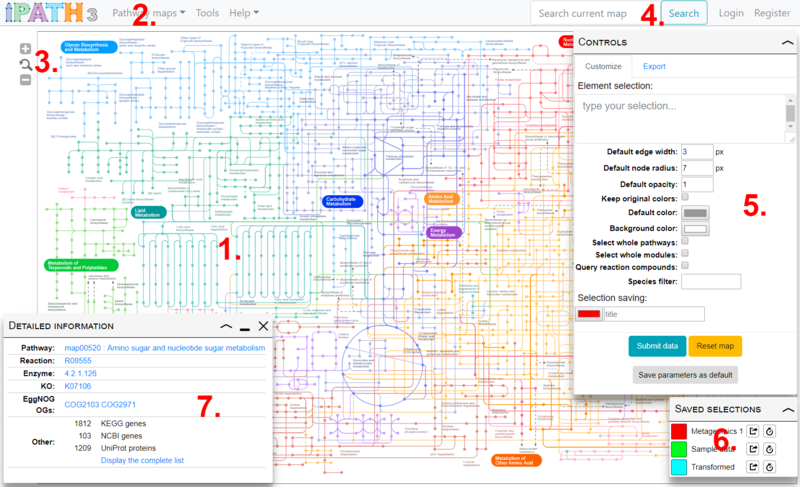 Use the Map selection menu to switch between various pathways maps available in iPath. Zoom controls. You can also change the zoom level by using your mouse wheel. Saved selections. Any saved selections can be restored or permanently saved. Element information box. 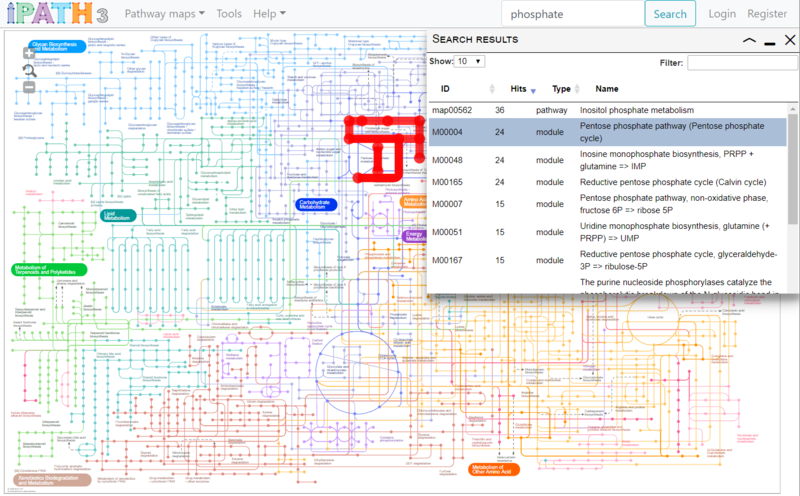 Click any map element to see detailed information on associated data. Type your query into the box, and click the Search button. Data associated with all elements of the currently selected map will be searched. Table columns can be sorted by clicking on the headers, and the results further filtered by typing into the filter box. Clicking on a row in the results list will highlight all its occurrences in the map. Check our map customization video tutorial. Element selection: Use this box to define customization parameters for various elements of the map. Each node and edge in the maps has various types of data associated with it (see the list below for supported data types). Each line of your element selection must start with an ID, followed by one or more customization parameters. All elements in the map which are associated with the specified ID will be customized according to your parameters. In the example above, all map elements which contain water (KEGG compound ID C00001) will be colored blue (#0000ff), half transparent (opacity 0.5) and have width/radius 20px (W20). Elements which are associated with KEGG orthoulogous group K00824 will be colored green (#00ff00), fully opaque and use the default width. Elements which are associated with KEGG reaction R09112 will be colored red (#ff0000), fully opaque and have width/radius 10px (W10). Default edge width: A value between 1 and 30 (in pixels); will be used for all edges which do not match your selection, or do not have a width parameter specified in the selection. Default node radius: A value between 1 and 30 (in pixels); will be used for all nodes which do not match your selection, or do not have a width parameter specified in the selection. Default opacity: A value between 0 (fully transparent) and 1 (opaque), which is used for all elements of the map which DO NOT match any of your selection IDs. Query reaction compounds: when using KEGG compound IDs in your selection, checking this box will make iPath check for presence of those compounds within all reactions associated with map's edges. Matching edges will be highlighted using the parameters specified for the compound in your selection. 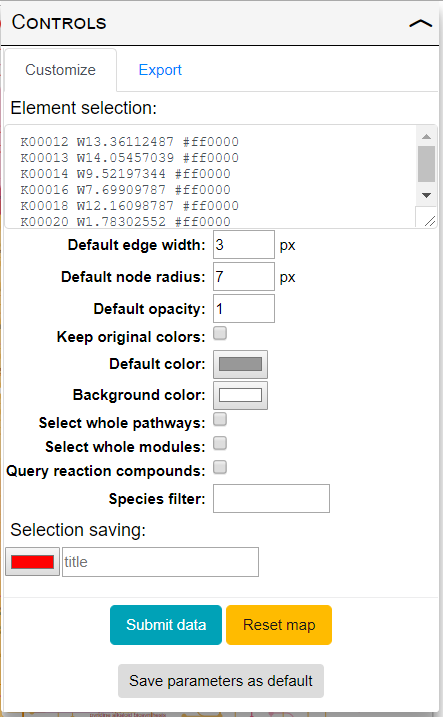 Species filter: specify a NCBI taxonomy ID or KEGG 3 letter species code in this box to display only map elements which are present in that particular organism. Rest of the map will be displayed in gray. Selection title: If you provide a title when submitting an element selection, all parameters will be saved and available through the 'Saved selections' panel. The following data types are supported by iPath, and can be used to customize the maps. Make sure you use the required prefix for each data type, as shown in the examples below. Hits: shows the total number of edges/nodes which were matched by each submitted ID. 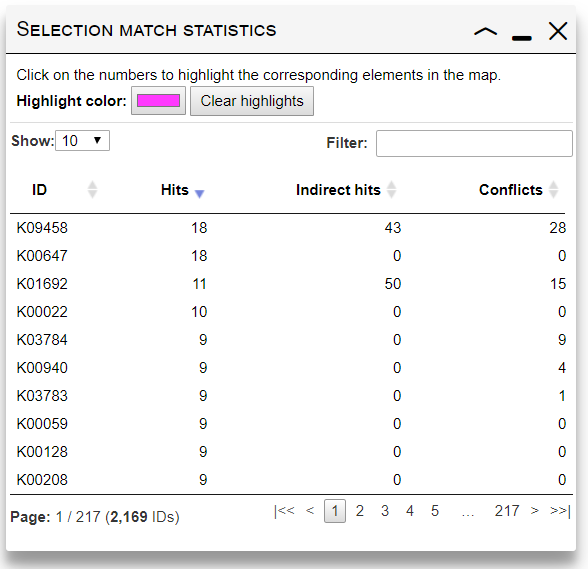 Indirect hits: shows the number of edges/nodes matched through "Select whole pathways", "Select whole modules" or "Query reaction compounds" options. 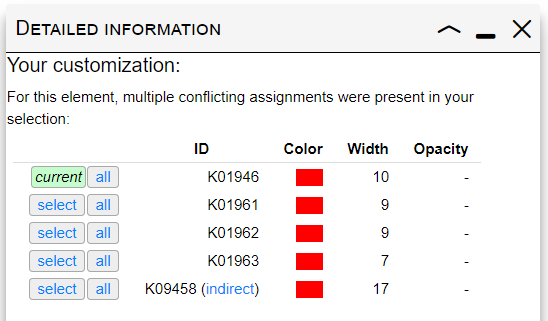 Conflicts: When multiple IDs with different parameters in your selection match the same element in the map, a conflict occurs. Only one set of parameters will be used (a random one). This column will show the number of conflicts where a particular ID occurs. Click on any number in the table to highlight the corresponding edges/nodes. When multiple IDs with different parameters in your selection match the same element in the map, a conflict occurs. Clicking on any edge/node where a conflict is present will display a table similar to one shown on the right. A list of conflicting IDs and their customization parameters is shown, with the keyword 'current' highlighting the currently applied parameters. Clicking the 'Select' button next to any ID will apply its customization parameters to the selected element. You can also apply the customization to all matching edges/nodes by clicking the 'All' button. Check our selection saving and time series video tutorial. 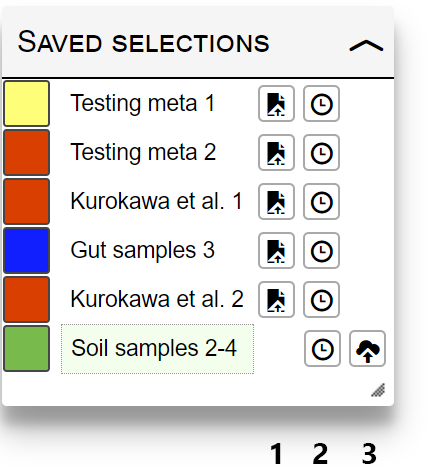 If a Selection title is specified when submitting data, all selection parameters will be stored, and can be simply accessed through the "Saved selections" box. 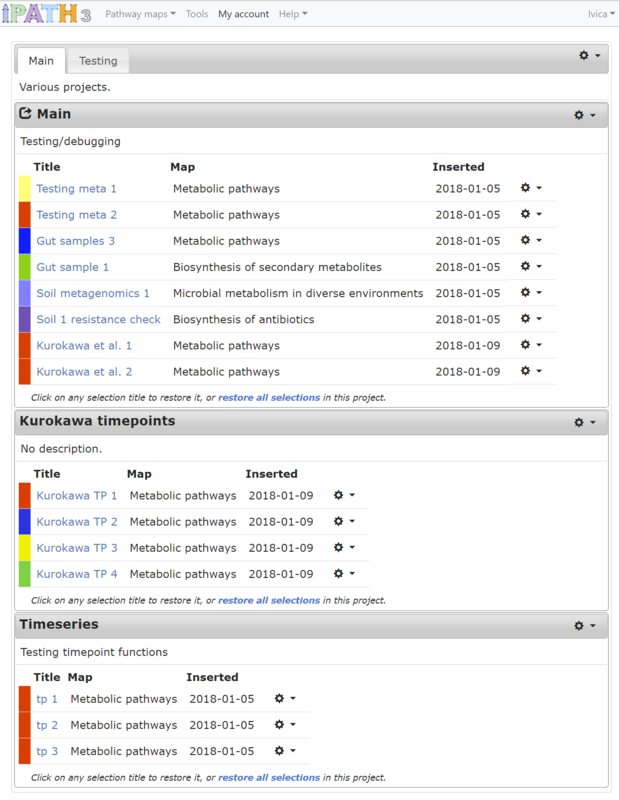 Saved selections are tied to the current iPath overview map. If you switch to a different map, customization data must be submitted again. Restore: reset the current map and restore the selection values. Save: save the selection to any project in your iPath account. This icon will not be displayed for selections that are already saved. Create your map customizations for various data points, and submit them one by one. Selection titles must be provided, which will make the selections available in the Saved selections panel. Add the selections to the time series by clicking the icon in the Saved selections panel. 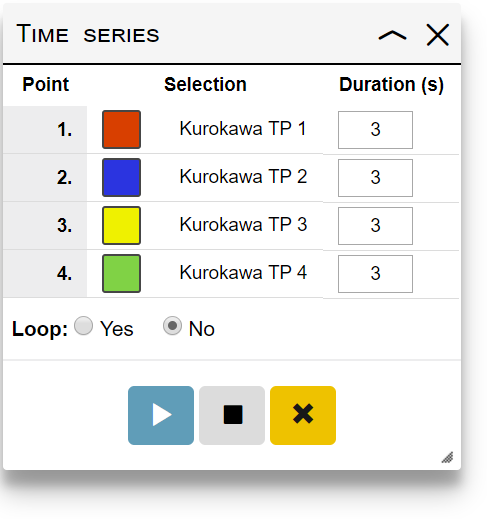 Once the first selection is added, a Time series panel will appear. Currently playing animation can be paused by clicking the play/pause button, or stopped completely by clicking the stop button. For further post-processing of the maps, use either SVG or EPS and a vector based editing software (like Inkscape or Adobe Illustrator). Note: Due to technical limitations, transparency cannot be preserved in EPS and PDF formats. iPath supports programmatic submission of element selections and other customization parameters, either directly to the interactive interface, or for automatic generation of graphical files in vector and bitmap formats. Please check the 'Direct submission' section on the Tools page for more information and detailed description of parameters/scripts. Check our iPath personal account video tutorial. Creating an account in iPath gives you the possibility to easily organize your element selections and access them from any browser. Selections are grouped into different projects, and these can be arranged into different workspaces. Configuration and functions can be accessed by clicking the icons in the corner of project boxes, in the workspace tab bar and at the end of each selection table row. respectively. Simply paste the contents of the file into iPath's element selection box, and set map background color to black for best results.